All Leigh Dovetail & Box Joint Jigs require a router with a 1/2" collet, fitted with a Leigh guide bushing. 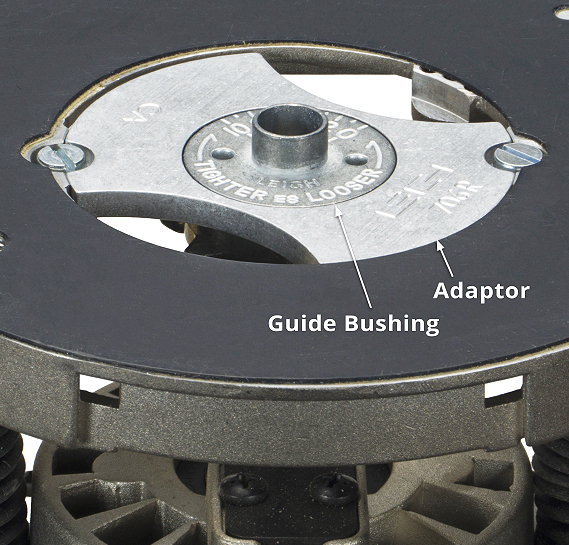 Your router may need a guide bushing adaptor. 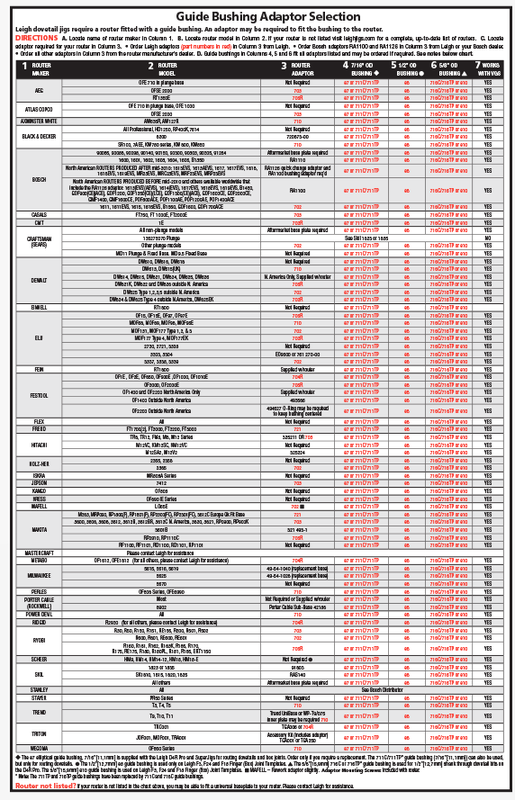 Click on the selector below to determine your router adaptor requirements. Leigh guide bushings are designed around the industry standard — a threaded bushing and nut having the dimensions shown. Some routers accept these bushings directly or come with an adaptor. 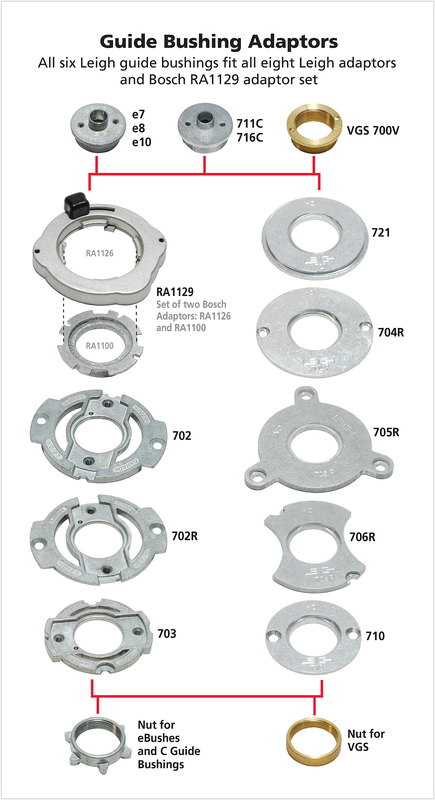 For those that don’t, Leigh offers several adaptors shown in the Guide Bushing Adaptors chart below. 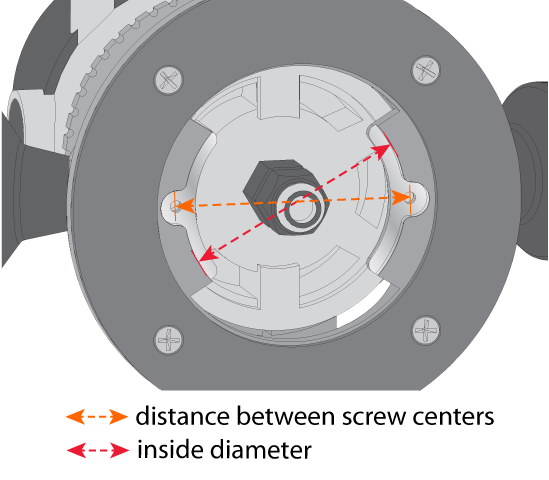 To determine if your guide bushing fits directly to your router, measure the opening in the bottom of your router. 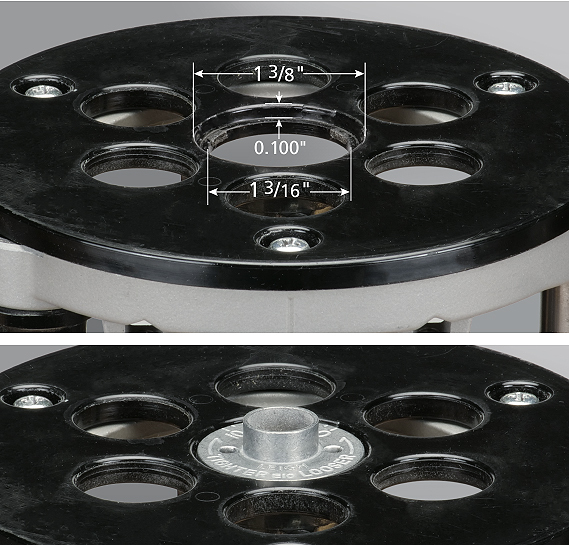 The widest part, or counter bore, of the opening must be 1-3/8" and the inner hole must be 1-3/16". If the opening matches these dimensions, you do not need an adaptor. 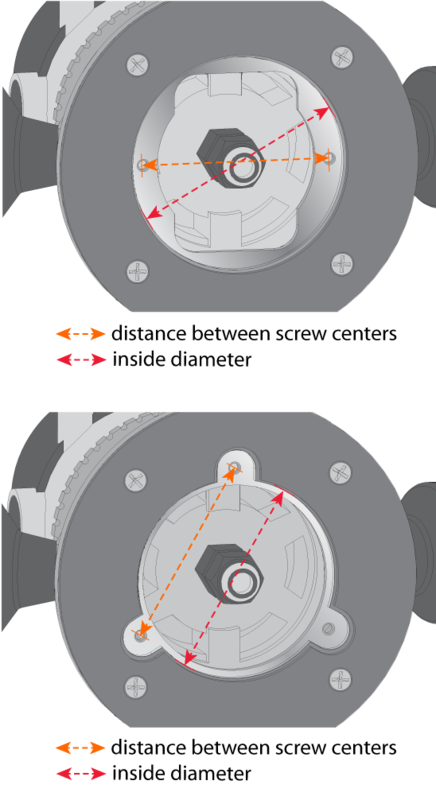 For all other opening sizes, refer to the guide bushing adaptor selector. Included with Leigh D4R Pro, Super Jigs and Box/Finger Joint Templates for routing dovetails and box joints. Also use with the RTJ400 for routing half pitch through dovetails. Alternative to e7, but only for routing through and half-blind dovetails on Leigh D4R Pro, D-series and Super Jigs. Use only on Leigh F3, F24 and F18 Box/Finger Joint Templates. Use on the Leigh RTJ400, B975 and F3, F24 and F18 Box/Finger Joint Templates. Use for 1/2" [12,7mm] shank through dovetail bits on Leigh D4R Pro and D-series jigs. 711TP (7/16” OD) and 716TP (5/8” OD) guide bushings were discontinued and have been replaced by the 711C and 716C. Because the router industry isn’t standardized, you may need an adaptor to fit your Leigh guide bushing to your router. Leigh offers several adaptors as shown. 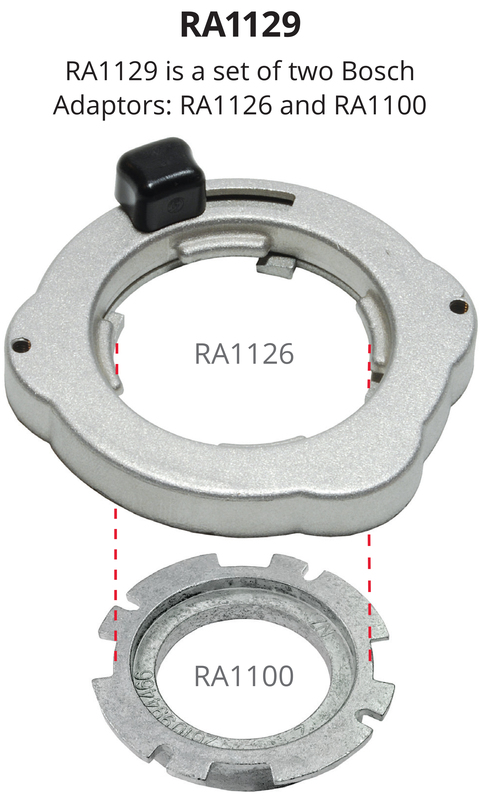 To determine the correct adaptor for your router, use the Guide Bushing Adaptor Selector in the next section. Use this Selector to determine your router adaptor requirements. If your Router Isn't Listed, Click here. Leigh recommends a midsize router, from 1-1/2 to 2-1/4 HP (9-13 amps) with a 1/2" collet. This size provides great power to weight ratio. Fixed base routers are ideal because they have a lower center of gravity with handles mounted to the router base rather than the motor, as with plunge routers. However, if you are proficient with the use of a plunge router, it works just as well. A plunge router is recommended for Isoloc Templates and is required for the M2 Attachment. When buying a router, also consider ergonomics, switch location, a good plunge mechanism and easy, accurate adjustment of bit height. 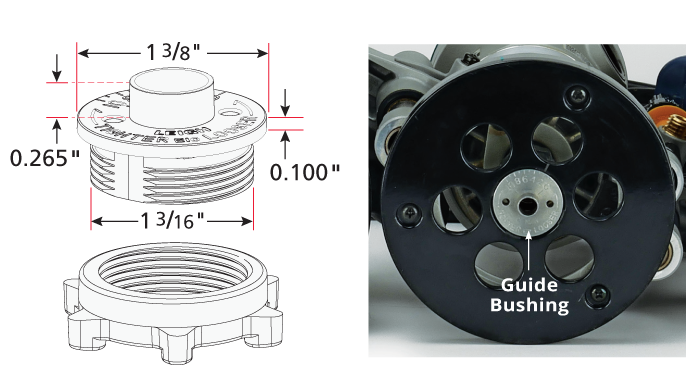 Why does Leigh use guide bushings, not bearings? Conventional guide bushings are much more versatile than shank mounted bearings. Bearings severely limit the range of board thicknesses, joint sizes and pin/tail spacing. Shank mounted bearings cannot provide the precise fit adjustments possible with Leigh’s elliptical guide bushings and the VGS. Why does the barrel length matter? Some manufacturer’s guide bushings have very short barrels and are not recommended for Leigh dovetail jigs. The barrel length on Leigh guide bushings is .265" (just over 1/4"). Shorter barrels or barrels recessed in the router base may cause the router bit to come in contact with the finger assembly. What is the Leigh VGS? Leigh’s Variable Guide Bushing System was designed for use only on Leigh Isoloc Templates and F1 and F2 Finger Joint Templates, for accurate adjustment of joint fit. Learn more about the VGS.